This is THE best carrot cake ever. Carrots are popular at our house. I had to work fast after my grocery buying trip to have enough to make carrot cake. And it was so worth it! Carrot cake is good. Spiced carrot pineapple coconut cake with nuts and raisins is celestial! This looks like a long recipe, but it really goes together quickly. Do take the time to measure the dry ingredients and mix them together before adding to the other ingredients. The mixing time with the wet ingredients is so short that it’s possible the flavors wouldn’t mix or you could end up with too much soda in a bite. Use flaked coconut as it really adds to the finished texture and flavor. Be sure to peel carrots before grating. Or, do like I did, grab a bag of baby carrots already peeled and put them through the food processor. You’ll want small pieces so stand the carrots up in the hopper so that the small diameter is cut instead of the longer length of the carrot. Pecans can be substituted for the English walnuts. Carrots have been used in desserts since the Middle Ages because they are somewhat sweet by themselves. They were plentiful and easy to obtain and much less costly than sweetener imported from distant lands. The Scandnavians are credited with the carrot cake, while Britons made carrot pudding popular in the 1700s. English colonists brought carrots to the New World where they were eaten as a side dish. Carrot cake didn’t turn up in American recipes until 1913. It wasn’t until the early Sixties that carrot cake and cream cheese frosting were wed. In 2005, carrot cake was declared among the top five favorite American desserts. One taste of this and you’ll see why! The cream cheese frosting is not a sweet frosting and is a perfect complement to the dense cake. Beat it a little longer than most frosting to incorporate air into the mix and make it light. You can add up to one more cup of confectioner’s sugar to the mix, if you want a sweeter, more firm frosting. The recipe also doubles nicely if you decide to layer the carrot cake or make cupcakes. Spiced Carrot Pineapple Cake -- a delightful mixture of textures and fragrant spices topped with creamy smooth frosting! Peel and grate carrots. I use a bag of baby carrots and run them through the food processor. Measure all dry ingredients into large bowl and whisk together. In mixing bowl, mix together carrots, drained pineapple, raisins, coconut flakes and walnuts. Add oil, vanilla and reserved pineapple juice. Add eggs one at a time, mixing well between each one. Slowly add dry ingredients and mix until well mixed about one minute. Do not overmix. Spray 9x13 pan with cooking spray and pour batter evenly into pan. Bake at 350 degrees for 40-45 minutes until toothpick inserted in center comes out clean. Allow to cool thoroughly before cutting or icing. Soften butter and cream cheese at room temperature. Cream butter until light about 2 minutes. Add cream cheese and cream with butter for additional 2 minutes. Slowly add powdered sugar, salt and vanilla. Mix well. If desired, you can add up to one more cup of powdered sugar to your desired sweetness and firmness. Keep at room temperature for ease in icing, but refrigerate any leftovers. I’m so glad you stopped by today! Follow A Pinch of Joy using the icons on the teal bar at the top of the page so you don’t miss a thing! I’d love to have your company on this venture!! Share: if you found this helpful or inspiring please pin for future reference! Or share on facebook or twitter by clicking one of the buttons below! Your support of A Pinch of Joy is appreciated! I love this! I will try and hold off til October to make it, though, because I would eat the whole thing right now. I found you through homestoriesatoz. Blessings! I love carrot cake!!! This one sounds super delicious!!! 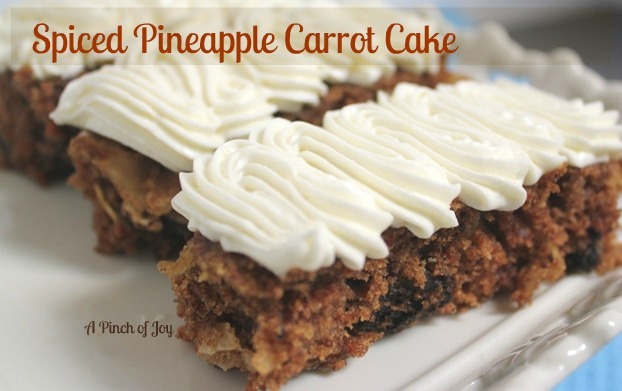 We just love Carrot and your Spiced Pineapple Carrot Cake looks delicious, I can’t wait to try it. Hope you have a great week end and thank you so much for sharing with Full Plate Thursday. Wow! That looks so yummy, I know my hubby would love it.